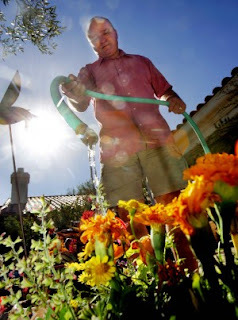 Sprinkler Juice: Watering at Noon Will Burn My Plants – Not! Watering at Noon Will Burn My Plants – Not! You've always been told that you should never water you lawn or garden during the day because it could burn leaves, stems, and blades of grass. Not true. This myth is one of the biggest gardening lies circling the gardening community to date. We assure you that any burn marks you see on plants or blades of grass were not made by watering at high noon, but more likely the result of fungal or bacterial diseases. Now, before you start switching up your watering habits, keep in mind that watering in the evening, at night, or early morning is still great practice. Here is why. Evaporation – Your biggest concern, when it comes to watering in the afternoon, should be evaporation. The hotter and sunnier it is, the more water will evaporate and less water will make it to the root zone. On hot summer day, water can easily evaporate from the air before it lands on plants, and from there, it can continue to evaporate off of the leaves, steams, and flowers. Evaporation is costly, and you’ll find that you’ll have to run your sprinkler system twice as long just to keep your plants hydrated. Watering in the afternoon is taxing on the environment and costly to your bank account. Fungal Diseases – Some of the most common plant diseases thrive in wet, warm conditions. By watering during the day, you’re making your plants a prime target for these diseases. At night, or in the early morning, when temperatures are cooler, and plant leaves and stems dry quicker, you'll be able to keep the risk of fungal diseases to a minimum. If your garden is currently hurting form fungal diseases, try watering at night when the air is dryer and cooler. If you've been watering your plants in the evening, or early in the morning, to avoid plant burns, keep doing what you’re doing. Although watering in the afternoon won’t physically burn your plants, watering during the cooler times of day is better for your garden, the environment, and your wallet. Just remember, if your plants are thirsty, don't be afraid to give them a drink, even if it's in the middle of the afternoon!